Latest GFS models forecast ferocious cold to grip Europe early next week. Source: Dominik Jung. Europeans longing for spring will just have to be patient for awhile. Indeed this winter has been a harsh one across the northern hemisphere with record cold temperatures being set from Siberia to North America to Japan. Also a number of places have seen record snowfalls. The European Alps have had one of the snowiest winters in years as snow continues to pile up meters high. Some warmists of course will dispute that cold and snow occurring locally do not mean much. Yet, this winter the harsh conditions have been widespread across our hemisphere, and across the globe, and is not what we were supposed expect from “global warming”. Reader Tom Mason here left a comment awhile Bach which I’ve decided to upgrade to a post. In his comment Tom mason lists some of the record cold temperatures and snowfalls occurring thus far. And now that severe cold is forecast to grip Western Europe, the list below will only get longer. Tom writes that what follows is a cut-down list that only starts from 1 November 2017 (I’d hate to see the length of the non-cut version). November: Up to 16 inches of snow for SW Alberta Rocky Mountains.By the end of November 2nd up to 40 cm (16 inches) of snow had fallen in some areas. Weather summary by Environment Canada, 3 November 2017. Many new record low maximum temperatures set in southern BC. Record cold in Winnipeg — Environment Canada meteorologist Natalie Hasell, the overnight low in Winnipeg on Wednesday night was –23.7 C (-10.7F). The old record, set in 1966, was –20.6 C. Brandon dropped to –25 C overnight, matching the 1966 record for that city. Ontario – “Mid-winter-like night” shatters 97-year-old record low temperatures. Minimum temperatures approaching the record low for November 11. Grande Prairie Alberta, after five days straight of heavy snowfall, nearly doubles snowfall record with 23.2 cm of snow Friday (Feb 2), nearly doubling the previous record for the day which stood at 12.2 cm set back in 1999 Seehttps://www.mygrandeprairienow.com/35843/grande-prairie-nearly-doubles-snowfall-record/ . More than a foot of snow for high Cascades, northern Rockies and Olympics — roads blocked for days. 16 inches of snow in Wyoming see https://www.grandtarghee.com/activities-events/winter-activities/ and video https://youtu.be/SRbvSFtsN_8 for Massive Snow Accumulation Records in U.S & Canada. Spokane snowfall shatters previous record — National Weather Service, a record 3.2 inches of snow fell at Spokane International Airport on Sunday, November 5. The old record for the date of 1.9 inches set in 2013. Vancouver Island — Coldest since 1919. New York City breaks 103-year-old cold record when it reached 25°F, old record of 25°F was set in 1914. Near-blizzard conditions for parts of northern U.S. Weather conditions will become dangerous in parts of northern Minnesota from International Falls through Walker, and the Brainerd lakes area. Snow, sleet, freezing rain, result in near blizzard conditions and icy roads. Snow for SW Texas cities of Freer, Benavides, San Diego, Alice, Orange Grove, Kingsville, Corpus Christi, Portland, Ingleside, Aransas Pass, Sinton, and Mathis. Redfield 2 heavy bouts of snow receiving 21.4 inches and 3 days later 44.3 inches. Phoenix measured 14.4 inches, while 10.5 inches fell in Camillus. São Joaquim (southern Brazil) has a new record of frost for December. And this is the second frost in December. So far there have been 116 days with frost at the top of the mountain range / SC. Oymyakon in Russia reaches -40°C. Severe freezing has hit parts of Evenkia, Irkutsk and Yakutia the temperature fell to -40, -42°C. It was even colder just east of Yakutia. In Ytyk-Kel and Churapcha, Teplyi Klyuch and Tompo, the thermometers showed -44 ° C, In Deliankir and Oymyakon -47°C. Far colder than normal in Siberia, n Krasnoyarsk, the average daily temperature was 23 degrees below normal. The worst freeze occurred on January 21, dropping to -40.3 ° C (-40F). January 25, the temperature dropped to -38.5, below the norm by 19 degrees. In Novosibirsk the daytime high – the high! – reached only -26.5 ° C, in Omsk only -24.2 ° C. A deviation of 13-16 degrees. Central and southern regions of Krasnoyarsk and Altai, it was -45 ° C, in the region of Kemerovo and in the Republic of Altai down to -40 ° C, in Khakassia down to -42 ° C, Tyva and Irkutsk Region down to -49 ° C, in the Transbaikal region down to -46 ° C.
January 26 in Novosibirsk is -30 ° C at night. In southern Siberia, the night temperature will be -40 to –45 ° C, in Tuva -45 to –50 ° C.
Ukraine the temperature dropped below -20°C, in Romania below -17°C, and in Bulgaria below -13°C. Russia: Once-in-a-century blizzard in Moscow see https://sputniknews.com/russia/201802041061337639-russia-blizzard-snowfall-weather-record/ and https://news.mail.ru/society/32447963/?frommail=10 and https://youtu.be/5RtaOTUz4QU and http://www.bbc.com/news/world-europe-42939644 reporting 2000 trees brought down by snowfall. Morocco: First snow in 50 years paralyzes southern Morocco. After January 20, 2018, when 3,100 miles (5,000 km) of roads were closed due to ‘exceptional’ snowfall. Now, just 9 days after that exceptional snowfall, the first snow in 50 years to hit southern Morocco has again blocked roads, making travel “absolutely impossible.” From 6 am Jan 28 to 6 am Jan 29, Amzri received 22 to 30 cm (almost one foot!) of snow and Imdrasse received 10 to 20 cm (3.93 – 7.87 inches). China: Early snow in China, in Changchun, Northeast China’s Jilin province. At the nearby animal breeding base for pandas and tigers, the animals appeared to be both surprised and amused by the unexpected snow. Mongolia: Far colder than normal in Mongolia. Temperature dropped to -32ºC (-26.6ºF) in Ulaanbaatar (the capital of Mongolia), and November 29 it dropped to -30ºC. The average daily air temperature was ​​10ºC below the perennial values. Afghanistan – Incessant snowfall shuts highway — The busy Salang Highway, linking Kabul with northern provinces, was blocked for heavy traffic as a result of incessant snowfall on Thursday morning. Lt. Gen. Mohammad Rajab, highway maintenance commander, said the road was closed after a snowfall of 45 cm (18 inches) in southern and 25 cm (10 inches) in northern parts of Salang. Bangladesh cold wave, regions of Dinajpur, Sayedpur, Pabna, Naogaon and Chuadanga are the mostly affected, see http://www.banglanews24.com/english/national/article/66031/northern-districts-shiver-with-cold . India – Uttar Pradesh – 70 dead due to severe cold. Sultanpur district low of 2.8°C, Lucknow shivered at 3°C. Bahraich recorded 3.4°C, Muzaffarnagar (4.9°C), Kanpur (4.2°C), Barabanki (3.4°C), while Varanasi, Meerut and Lakhimpur Kheri were all at 5°C. China: Record snowfall in China – 2.5 million lose power. First heavy snowfall January 7th followed by a bigger second snowfall, January 10. All power in Suizhou, a city of 2.5 million people in Hubei province, was down due to heavy snow, state broadcaster China Central Television reported. Temperatures in Suizhou were expected to plunge as low as -5C (23F) over the weekend. January 7th reporthttps://www.reuters.com/article/us-china-weather-snow-food/china-fruit-vegetable-prices-surge-as-blizzards-cut-off-roads-damage-crops-idUSKBN1EW0ET , and January 10 report http://www.thebigwobble.org/2018/01/china-hit-by-second-wave-of-snow-after.html . Arctic blizzard in Bologna – Video at www.facebook.com/severeweatherEU/videos/2115374465352310/?_fb_noscript=1. “The storm lasted for several hours and left 10 cm of fresh snow on the ground! Turkey – More than 3 feet of snow in 12 hours http://strangesounds.org/2017/12/mighty-snowstorm-turkey-artvin-drops-1-meter-of-snow-in-12-hours-blocking-roads-and-closing-schools-in-artvin.html and In the live animal market in Erzurum’s Oltu district, sellers burned car tires to warm the livestock https://www.dha.com.tr/yurt/erzurum-donuyor-kar-kalinligi-80-santimetreye-ulasti/haber-1553658 . The temperature is low. Frozen locally strong in the central and northern. Temperature: from -02 (minus 2) to 6 degrees Celsius. Greece – Snow strands hundreds for hours on highway, see www.keeptalkinggreece.com/2017/12/22/greece-athens-lamia-highway-snow/ and https://youtu.be/PSlb_IlzaKs . Fine bit of work, Tom! And thanks, Pierre, for highlighting it for us. Thank-you yonason (from my cell phone), I did have a much longer list (2007 to 2015) but is was lost in a hard-drive failure. I know I should have backed it all up. I’ve learned a hard lesson there. Much of this is culled from blogs, news and weather agency reports. I am especially indebted to the Ice Age Now (www·iceagenow·info) website for getting me started again. Oh, yes. Ice Age Now is a good site for info not readily available elsewhere. You do have to vett the links people send to him, because occasionally one won’t stand up, but that’s true of nearly all the good sites. And that reminds me – one of the reasons I like Pierre’s blog here, is because he’s one of the most reliable. In fact I can’t remember any errors he’s made, serious or otherwise. B. C. and adjacent Washington State are still cold and will remain so for at least another week. Currently we are at -10°C. Sun is about to come up and the rise to just below freezing will begin. And we are supposed to prune some wine grapes. Meanwhile, back in Ohio there was a 2 day heat-wave. Now gone. Now that it is getting cold just about everywhere, the blame lies solely with the greens for reducing the CO2 just about…you guessed it, everywhere. it was reading that site that spurred me on to start again. Cold weather becomes warm weather. This is man made global warming. If the weather models are to be believed then it is quite likely that many European cold records may fall in the coming couple of weeks. 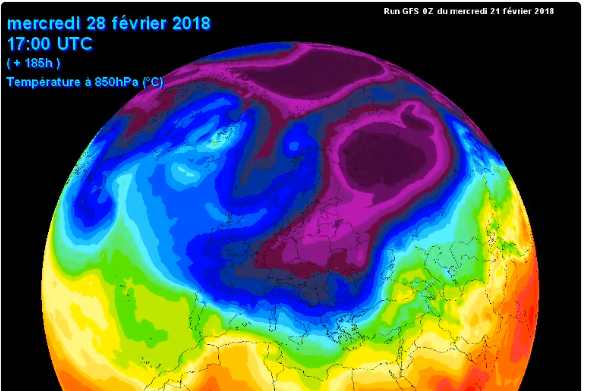 There appears to be a Siberian/Polar blast of very cold air lined-up and ready to descend to central Europe and the UK. Exactly when and were is subject to change but this time next week appears to be the time when some major cooling (Warm Hole?) will occur. A general caveat is that looking further than say 5 days ahead with these models is fraught with measurement and systematic errors (just like the climate models). Additionally at the moment the Northern Hemispheres weather patterns are being disrupted by the effects of last weeks Sudden Stratospheric Warming(SSW) event. SSW are poorly understood and can not be modeled adequately as very little is known about the why, and where they will (or will not) affect the underlying atmospheric processes of the troposphere. However the general trend (from GFS, GEM, ECMWF, JMA, UK-MO, ARPEGE, etc. weather models) for the last 2 weeks of watching this cold spell evolve, Indications from all these models imply daytime temperatures well below freezing, and some areas may get to -20°C overnight (Poland, Germany, France?). This cold period is likely to last through to the first week of March. Widespread heavy snow is very likely, however none of the models are good at exact locations or amounts forecasting for snow this far out (the same as climate models!). My advice is prepare for the worse, hope for the best! CO2 warming appears to have failed to make the grade — AGAIN! So where’s the much advertised global warming, eh? I’m not seeing it, who is? When people hear about global warming but keep feeling the cold they know they are being lied to. You sounded almost reasonable until this paragraph. Sees a cold winter week and asks where global warming is to save the day … a certain president had a mind fart of equal proportions a few weeks ago. Remember? I’ll remind you of your logic during the next heatwave. I’ll write something about where the cooling is that skeptics claim would happen. I’ll tell you that people will think they are being lied to by you, because of the heat outside. Notice a problem with that kind of argumentation? The temperature anomaly is currently at 0.6°C above the 1979-2000 mean. SST anomaly is 0.1°C above the mean. Ocean heat content BEFORE 2003 was assumption driven models. After 2003 was measured sort of with sparse measurements. And as well all know, ANY ocean warming is TOTALLY NATURAL and out of the COLDEST period in 10,000 years. From 1950, also highly affected by the AMO and PDO oscillations. PERFECTLY NATURAL CYCLES. There is no mechanism and there is zero empirical proof of any sort, that there is any human fingerprint whatsoever on ocean heat content, which is just a tiny fraction of a degree at most. …you CANNOT provide one single bit of scientific proof that enhanced atmospheric CO2 warms the oceans, atmosphere or anything. It is well below freezing over most of the island, you focus on three spots…..
What about the temperature in New York yesterday? Is that a sign of global warming when a day of cold weather is a sign for global cooling for you guys? No. We are just showing that all the predictions made 10 and 20 years ago claiming disappearing snow etc. were false. Things really have not changed anywhere near as much as the alarmists are trying to brainwash the people to believe. Of course the alarmist brainwashing has been successful on some people, Seb. Well, should we have a look at some of the predictions coming out the “skeptic” corner? Maybe yours? Weather is weather. You’ll always have extremes in both directions. The change is in the average, the heat content itself. Imagining that this is not happening because of some cold days (which are still warmer than the average) is a bit strange. …leaving NOTHING but oozing greenie slush !! What is this “global warming” you are yapping about, seb?? Many places around the globe ARE NOT WARMING. If you put your foot in slightly warm water, do you say your whole body is warming… That’s just DUMB. …. even though you have absolutely ZERO EMPIRICAL EVIDENCE. Seb shows he KNOWS ABSOLUTELY NOTHING about how an increased jet stream works. Nothing unusual about his total lack of understanding. This list of record low temperatures is “weather”, just like record high temperatures is just “weather”, despite what climate “scientists” say about the latter. That is to say that record highs and lows get broken all the time. I also find it interesting that cold records for last century get broken, especially when they are batched up like this in short time periods. If these were hot records being broken the media would be all over them. The media seems very reluctant to report batches of cold weather records being broken, which is why I started keeping for myself. I think people are beginning to see the light as these batches of cold weather occur, weather has been warmer and cooler in the past, and the general trend is not for much warming (if any), certain nothing like the hyperbolic nonsense that Hansen, Mann, etc., tend to favor. Overall my general message to people is that CO2 is not doing anything, show me where tiny rise in this rare atmospheric gas deleteriously affected your life? Stop worrying about the planet warming it really doesn’t matter, life adapts to it, if you must worry, think about all the hardships from it cooling. Warmer, wetter weather with more CO2 in the atmosphere is just the recipe for a better life. Cold is bad — it kills with starvation, with desertification, it slows life, it is very, very dangerous. Global warming doesn’t mean that you’ll suddenly have tropical climate in Norway. Apparently it needs this kind of change so a skeptic like you would recognize it as noticeable change. That’s an interesting conclusion. Weather is warm and cold, therefore CO2 does nothing. Very scientific. And no, people don’t notice slow changes. That’s why we keep records and surprise, they show a change. Surely life adapts. Question is whether the cost of adapting is higher than the cost of limiting the effect. Life would also adapt to a nuclear winter, but I am sure even you would probably agree that it’s desirable to prevent such a thing, right? And it’s not going to cool. You’ll see … in a few years people will look back at this episode and remember (from the records) that skeptics (again) didn’t see the greater picture. Remember 2008? Or any year/month that wasn’t a warm as the year before in the last decades? You probably freaked out and declared global cooling is here. Did you? Another empty NON-science brain-hosed post from seb. Yaps so much says so little of any substance. He just “believes” in his AGW religion and the fallacy of CO2 warming, and no LACK OF ANY EMPIRICAL EVIDENCE will be allowed to get in the way of reality and rational scientific thought.. Sorry seb, NO change in the last 40 years except in areas affected by El Nino and ocean cycles. No sign at all of any human or CO2 forcing in any real data. Enhanced aCO2 DOES NOT cause warming of oceans, atmosphere, or anything. How’s the fossil fuel heating helping you adapt to “global warming” at the moment, seb ? Good luck to all you guys in Europe. Let’s just hope the decimated fossil fuel electricity supply systems hold up for you. Solar isn’t going to be much help either, buried under snow and ice. or summer in a decent Aussie heat wave. As the freeze sets in will Europeans listen to the foolish chatter of the news media, or to the reality their chattering teeth tells them? No sign at all of any warming. “Global” (lol) or otherwise. Nowhere near as HOT as the late 1800’s. ! And of course the cold periods in North America, North Africa, Siberia, etc., amounted to quite a time, thus rendering those odd record breaking hot minutes (like the UK’s Heathrow Airport’s record breaking half an hour of heat) rather academic. Down here in Australia, BOM got caught out using 1 second records to try to CREATE new temperature maximum (as well as chopping off any low values for cold.) ! Add yet another COLD record. BTW…all those record cold days will be quietly adjusted out of existence in short order by NASA/NOAA…. The CERES data for January 2018 indicates the planet had a net heat input of 15.9W/sq.m. Typically the planet takes in heat in the Austral summer and loses heat in Austral winter due to higher proportion of ocean surface in the Southern Hemisphere than the Northern. By comparison the net heat input in January 2017 was 16.3W/sq.m. Although the globe heated in January this year it is a little less than the heating in January last year. This is consistent with a slight increase in exposed ocean surface in both Arctic and Antarctic in Jan 2018 compared with Jan 2017. The caution with this data is that it has long term calibration to measured ocean temperature to 2000m so absolute values have to be viewed as near meaningless. By contrast the relative values should have good precision. Parts of Australia have had a hot summer. The majority of the Australian continent has experienced average or cooler-than-average temperatures. I’ll lay London to a brick that NASA will still be saying in December that 2018 was the hottest year eevvvvaaaaahhhhhhh! Even if they don’t, they’ll just cobble together something else to justify themselves. Hotter than average? Global Warming, theory verified. Colder than average? Global Warming, theory verified. Normal temperature? Global Warming, theory verified. No doubt necessitated by the cold, for which solar and wind are no help. I noticed this in July. When there were reports of unusually cool readings in the NH and SH, at the same time. That station in Greenland recorded -31 C in July. Stations in Argentina, South Africa, and Australia recorded unusual lows during their winter. Over time, a new trend will be set. At some point it can be called climate.